Where are we located? What are our business hours? How can I get a rental car? How can I get my car towed? Can I take my car to any body shop? What is a Direct Repair Shop? What insurance companies do we work with? Where do I get a claim number? Do I have to get multiple estimates for my insurance company? Will parts be ordered before I drop off my car for repairs? How long will it take to fix my car, and when can I pick it up? How long does glass repair or replacement take? Can I get other work done on my car while it is in for repair? Do We Provide "Paintless Dent Repair"? If my car's frame is damaged, is it a total loss? What are "Betterment Charges"? Is there a warranty on the repairs to my car? Do I have to pay the deductible? We are located at 4440 W. Addison St. in Chicago, IL. B & M Auto Collision Center is located in the Lakeview / Wrigleyville area on the north side of Chicago. From the Kennedy Expressway (I-90/94) or Lake Shore Drive, take Irving Park Road to Broadway. Go north one and one half blocks to 4080 N. Broadway. We are on the west side of the street. Drive up through the garage entrance and come into the office. B & M Auto Collision Center is proud of its long standing relationship with Enterprise Rent-A-Car and Hertz Rental. Call us and we will be happy to arrange a rental car for you. When you drop off your car we will arrange for Enterprise Rent-A-Car or Hertz Rental to pick you up. Insurance companies will only pay for a rental car if you have that option on your policy or if you are the claimant. Check your insurance policy or call your agent and find out if you have car rental coverage and what your coverage limitations are. If you do not have car rental coverage we will ensure you the lowest rate possible with car rental company. HOW CAN I GET MY CAR TOWED? We work with A AllStar Towing. We will be happy to arrange a tow for you. If you need an emergency after hours tow please call A AllStar Towing at 773-619-5051. CAN I TAKE MY CAR TO ANY BODY SHOP? Illinois law provides that you can take your car to any repair shop of your choosing. Professional, well regarded, auto body collision repair businesses such as B & M Auto Collision Center work directly with major insurance companies as a preferred repair shop through their Direct Repair Program(s). When you use a preferred shop the repair process is streamlined. Because of our strong relationships with many reputable insurance companies we write the estimate, we order your parts, and can begin immediate repairs on your automobile. Body shops earn the right to be in preferred shop programs by meeting certain criteria including having certified technicians, using proper equipment, and most importantly having a record of satisfied customers. Insurance companies constantly monitor their preferred shops to insure quality repairs. B & M Auto Collision Center works with most insurance companies. Your insurance company will issue a claim number at the time you report your accident. Call B & M Auto Collision Center with your claim number and we will handle the insurance claim process for you. No. Illinois law states that you only need one estimate of repair. Do not waste your time running around getting estimates. B & M Auto Collision Center will negotiate on your behalf with your insurance company to insure a fair and proper repair to your vehicle. WILL PARTS BE ORDERED BEFORE I DROP MY CAR OFF FOR REPAIR? Yes. Our goal is to provide you with a quick turn around time. We generally order your car’s parts at the time that we write your estimate and schedule your car for work. Other shops may take weeks to process your claim and order parts. Of course every case is different, but we do our best to turn your car around quickly. We will give you an estimate of the time it will take to complete the repairs. You can contact us at any time and we will provide you with an update on the status of your car. We will contact you when your car is ready to be picked up. Please feel free to call us at 773-685-3200 or email us at info@bmautocollision.com. HOW LONG DOES GLASS REPAIR OR REPLACEMENT TAKE? B & M Auto Collision Center offers same day glass replacement. We use the highest quality glass for collision protection and visibility. CAN I GET OTHER WORK DONE ON MY CAR WHILE IT IS IN FOR REPAIR? Absolutely. You may want to have us do additional body repair not covered in your auto insurance claim. We are a full service auto repair shop. We do both ordinary auto maintenance and major mechanical repairs. We have developed long and trusting relationships with our customers who rely on domestic and foreign cars to take care of all of their auto service needs. DO WE PROVIDE "PAINTLESS DENT REPAIR"? Yes. If you have door dings or dimples caused by hail, paintless dent repair may be a cost efficient solution rather than full body and paint work. 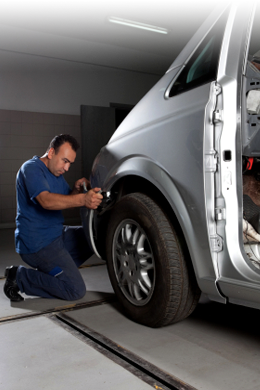 We can advise you about your alternatives when your car is being inspected. IF MY CAR’S FRAME IS DAMAGED IS THE CAR A TOTAL LOSS? No. A car is a total loss when the price of repairs exceeds the insurance company’s determined value of your car or when the car is structurally not repairable. Today most cars are built using unibody construction, meaning that frame and body are one. If a section of the frame is beyond repair we can simply replace that section. B & M Auto Collision Center will return your car to pre-accident condition. Parts that wear out and need replacement over time are commonly subject to betterment charges. Parts such as batteries, tires, and suspension parts that may need to be replaced during the repair process may be subject to betterment charges. These betterment charges are determined by your insurance company and are prorated and may be an additional cost to you. IS THERE A WARRANTY ON THE REPAIRS TO MY CAR? B & M Auto Collision Center guarantees our auto body repairs with a lifetime warranty for most of the insurances. Workmanship and paint are warranted for as long as you own your car. Parts are warranted per manufacturer’s specification. DO I HAVE TO PAY THE DEDUCTIBLE? Yes. The deductible must be paid per your insurance policy requirements and subject to Illinois state law. The deductible is usually paid when you are picking up your car upon completion of repairs, although you can prepay if desired.